Carl Edwards won the 66th Annual Bojangles' Southern 500, his 25th victory in 398 NASCAR Sprint Cup Series races. This is his second victory and ninth top-10 finish in 2015. This is his first victory and eighth top-10 finish in 12 races at Darlington Raceway. Brad Keselowski (second) posted his third top-10 finish in seven races at Darlington Raceway. It is his 17th top-10 finish in 2015. Denny Hamlin (third) posted his eighth top-10 finish in ten races at Darlington Raceway. Matt DiBenedetto (25th) was the highest finishing rookie. Kevin Harvick leads the point standings by 42 points over Joey Logano. 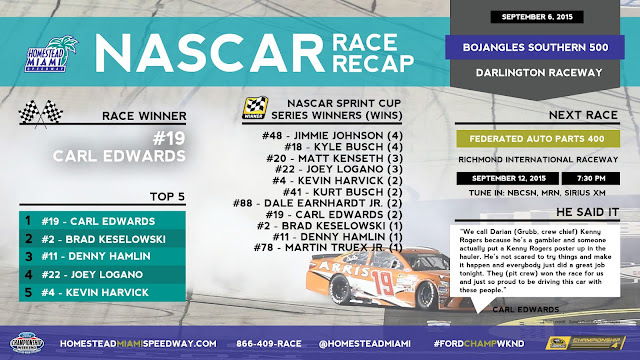 Carl Edwards has two wins (2008, 2010), five top-five finishes, seven top-10 finishes and two poles (2005, 2011) at Homestead-Miami Speedway.